April | 2010 | can i just finish my waffle? It. is. a. joke. “Think Progress” is making an issue of this comment, (pulled out of a 3-hour show) audio and all. Maybe they should just “think.” You have to point these things out to those with no sense of humor. Limbaugh was discussing the new Arizona immigration law SB 1070, full text. Put this in the context of the riot police called out yesterday on the peaceful assembly of tea partiers, you see the “regime” and their mouth, the media, protecting the “basic notion of fairness” for illegals and at the same time harrassing and trampling on the rights of citizens. You think just maybe the word went out – use the theme “show me your papers,” and make people think about Nazis when they think of the Arizona law? MARTHA MACCALLUM: Critics have said that it’s akin to the Nazis, in terms of demanding people’s papers. CAMPBELL BROWN: Show us your papers. LESLIE SANCHEZ: Stop and show us your papers. HOWARD FINEMAN: Let’s see your papers. ELEANOR PELTA: A let-me-see-your-papers environment. CHRIS MATTHEWS: Can he stop the car and say, “Let’s see your papers”? SETH MEYERS: Can we all agree there’s nothing more Nazi than saying, “Show me your papers”? LIMBAUGH: (German accent) “Your papers, please!” It equals Nazi. That’s why Obama’s using the term. I can understand Obama being touchy on the subject of producing your papers. Maybe he’s afraid somebody’s going to ask him for his! Transcript of Limbaugh’s program yesterday is Here. I heard Governor Brewer state her position on Greta Van Susteren. She was strong and resolute, and I love this woman. SUPPORT GOVERNOR JAN BREWER AND THE GREAT STATE OF ARIZONA. Unbelievable. The President of the United States is taking the side of illegals against a sovereign state in the United States of America. Maybe he should have Eric Holder examine the federal immigration laws and see about enforcing them. He is sending or encouraging Al Sharpton to go down to stir up trouble. He is himself setting up a situation where violence is actually very likely to occur, violence of illegals against American citizens. So just whose fairness is he concerned about? Has he forgotten that his primary duty is to protect the citizens of this country? The Justice Department and Homeland Security is “conducting a review” of the Arizona law. Our Justice Department and Our Department of Homeland Security, instead of supporting the citizens of Arizona, are actually standing against them. Notice he says “notions of fairness that we cherish” – not protecting the rights of the American people, but for somebody else, who likely is not a citizen. Other “notions Americans cherish” are freedom of speech and the right to assemble, and he has done nothing but try to shut out dissenting voices from the American people, allowing us to be slimed day in and day out, most recently the words of his ACORN friend Bertha Lewis calling the Tea Party movement a “bowel movement.” This is referring to American citizens now mind you. She made this and other interesting comments as she was speaking before a group called, get this – the Young Democratic Socialists. If you ever see President Obama move quickly in making a statement or stating a position, it is always about his concerns for citizens of some other country. It took him about 15 minutes to come out and state he was concerned about the Arizona law being “irresponsible” when he had not even had time to read it to know what it said. And his mouth, the media, is out there doing everything they can to stir up trouble and promote violence. The law would not be necessary if the federal government would enforce the immigration laws already on the books. If somebody is hurt or killed down there, it will be laid right at the feet of the President of the United States. Instead of showing some leadership in keeping the peace, he is inciting racial and class violence. The left stirs unrest: And one media outlet described this as “mostly peaceful.” After they have spent over a year now trying to portray the tea party protesters as violent. No bias there, nah. What with a meeting with Billy Graham in the morning and the memorial service for the miners in West Virginia in the afternoon, President Obama got a good dose of that ole’ time religion yesterday. Fox ran the memorial service uninterrupted and without narrative, so one really got a sense of how purely Christian it was with no attempt to take the guts out of it and make it “acceptable,” and also to realize just how long it was. Leave out the media mouths and their constant anaysis of everything, it is easier to see the full picture and make up your own mind. I think Obama and Biden get many points just for sitting through it. But then they had to, they were last to speak. In my opinion, they moved up in the polls a bit, at least in my poll, more for attending than for what they said. I didn’t think they made it too political, not too bad. The most political speech was by W. Virginia senator, Rockefeller. And I really like the governor. I would have some advice for Obama at this point if he by chance wanted to give some effort to being a president to all the people, but I’m sure he wouldn’t be interested in what I had to say. 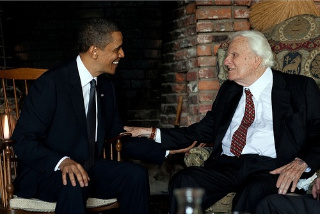 Barack Obama today became the 12th president to meet with Billy Graham, and the first sitting one to visit Graham’s mountaintop home in Montreat. In a meeting that lasted 30 to 35 minutes, the president and the 91-year-old preacher prayed for each other ….. The younger Graham [Franklin] also said the Pentagon’s decision to disinvite him also came up. “He was going to look into it,” Graham reported. Did that mean there was a chance he would be re-invited? The Obama administration said Thursday it will appeal a court decision that found the National Day of Prayer unconstitutional. 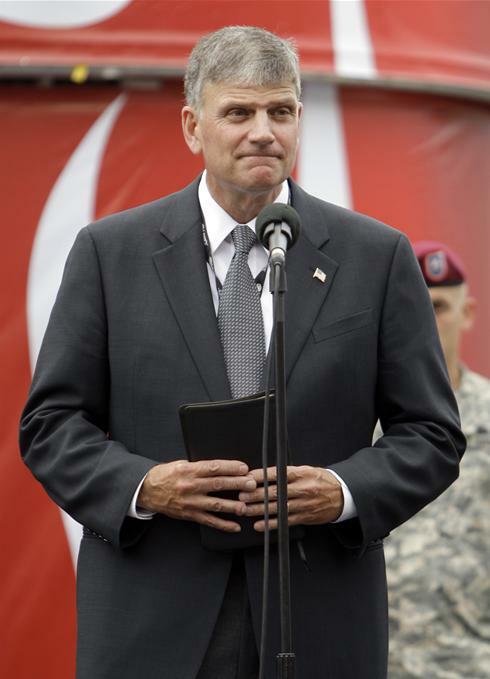 Evangelist Franklin Graham‘s invitation to speak at a Pentagon prayer service has been rescinded because his comments about Islam were inappropriate, the Army said Thursday. Graham, the son of famed evangelist Billy Graham, in 2001 described Islam as evil. More recently, he has said he finds Islam offensive and wants Muslims to know that Jesus Christ died for their sins. “To act like a National Day of Prayer is a bad thing or somehow subversive is ridiculous. Surely our country needs prayer now more than ever, ” said Franklin Graham, National Day of Prayer Honorary Chairman. Okay. Let’s face it. Rev. Graham made a statement in 2001, I believe it was, about his belief about Islam and then, again, he stated he hoped Muslims would come to know that Jesus Christ died for their sins. He has a right to state his beliefs. After all he is a CHRISTian. If he did not believe that Christ died “not for our sins only, but for the sins of the whole world” he would not be a Christian in the first place. Forgiveness of sins is the essense of Christianity. And if he believes this, certainly he would want all to know about it. “Come unto me all ye who are weary and heavyladen and I will give you rest.” This is Christ’s invitation. It is not a command. But notice he is the Honorary Chairman of the Day of Prayer. The Chairman of the Day of Prayer and a Christian minister cannot say a prayer at the Pentagon? Bear in mind he’s not preaching a sermon. He’s just going to say a prayer. He is saying a prayer for our country. Who could possibly object to that? That said, I agree with him “NO JUDGE CAN STOP US FROM PRAYING FOR OUR COUNTRY” and I will add that the United States Army should be ashamed. But, hey, he can go somewhere else and pray, but I can’t help but wonder how many men and women in the military would be more than happy to join in prayer for our country. When I will start to worry is if there is a proclamation or a law that we have to pray or that we are forbidden to pray. WASHINGTON — The Obama administration on Friday defended the new health insurance law after a report from its own Medicare services agency showed the provisions will INCREASE the nation‘s health care tab over the next 10 years instead of bringing costs down. They have lied, folks, and are now defending their lies. We all know it. I dare say more ordinary citizens have read and researched this health care law than members of the congress. And the press? Where were they? Health and Human Services Secretary Kathleen Sebelius ignored the bad news Friday, emphasizing that Chief Actuary Richard S. Foster agrees that 34 million people will be insured who aren’t currently. “I don’t doubt that those who opposed health care reform are going to continue to make the same, tired old arguments that have been made for years and years as it relates to health care.The president will and the administration will continue to talk about the benefits of what was passed in the law as many of those benefits come on line in the next several months,” he said. – Businesses would pay $87 billion in penalties between 2014-2019 for failure to offer insurance. The truth comes out as time goes on, and is there any wonder I don’t trust what Chris Dodd and the administration is saying about the financial reform bill?